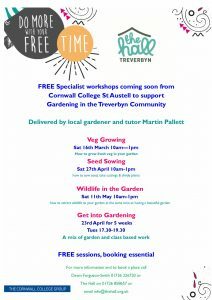 This spring, Cornwall College are offering FREE gardening workshops at Treverbyn Community Hall. 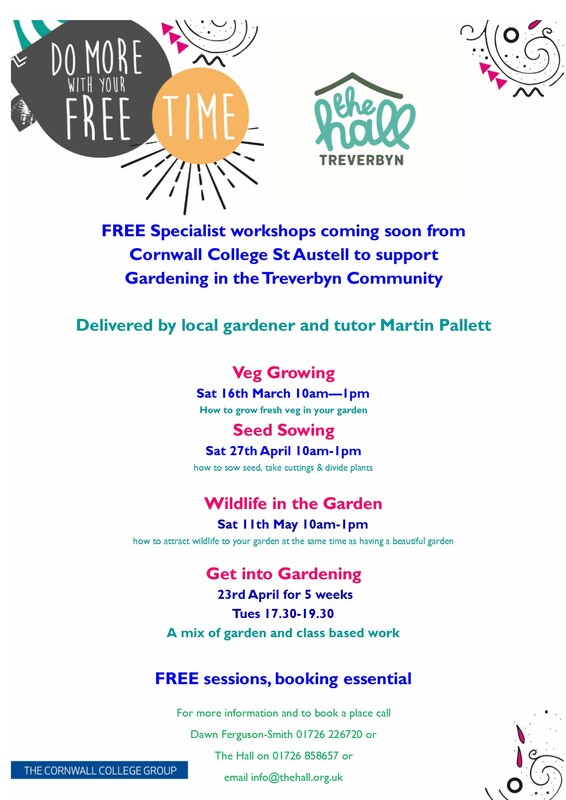 We hope that these brilliant workshops will give you a unique opportunity to learn more about getting the most out of your garden. Come and learn about how to grow your own veg and save money at the supermarket. Or be the envy of all your neighbours without spending a fortune at the garden centre by learning how to sow seeds . Maybe you want to know how to attract more wildlife to your outdoor space or perhaps you are totally new to gardening and just need some help with the basics to get you started. Whatever your background or ability, we have a gardening workshop for you because we think everyone should be able to enjoy the great outdoors from their own back door. These gardening workshops have a maximum number of participants so that we can give enough attention to each participant. Booking is essential so sign up now to avoid disappointment. If you don’t have your own garden, or even if you do but want to meet like-minded people, why not join our Community Gardening group on the 1st Sunday of each month.